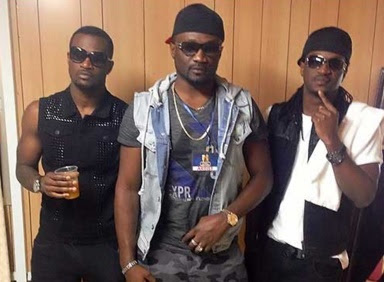 Welcome to Mercy Ebute's Blog: Jude Okoye finally give up managing his brothers, PSquare. Jude Okoye finally give up managing his brothers, PSquare. Jude Okoye is finally done with his brothers P-Square and he has removed them from the lists of artists he manages. We guess Jude is tired of Peter calling him out and his fans also asking him if it is by force to manage the two brothers. One thing that is however not clear is if the duo of P-Square will actually break up after this. Peter was quoted to have said, Paul said, if Jude no longer manages them, then they can as well say BYE TO THE P-SQUARE BRAND. 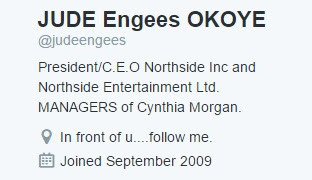 Jude’s official twitter handle now only reads ‘President/C.E.O Northside Inc and Northside Entertainment Ltd. MANAGERS of Cynthia Morgan’.